Finland brought a bit of rock back to the Eurovision Song Contest again in 2014. Finland is renowned for their rock contributions to the Eurovision Song Contest, after all, Lordi did win with "Hard Rock Hallelujah" for Finland back in 2006. Softengine managed to get 72 points, placing Finland 11th in the Grand Final, just missing out on the top ten, but as I've said time and time again, 2014 was a competitive year. 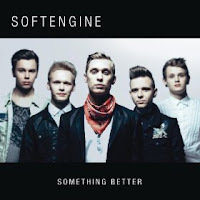 A pure performance based music video for "Something Better" from Softengine, showing the energy they have on stage. Softengine were a five piece rock band at the time of this music video, consisting of Topi Latukka, Ossi Mäkelä, Henri Oskár, Tuomo Alarinta and Eero Keskinen. The band is currently a four-piece rock band, as Eero Keskinen left the group to follow his career as a lighting technician. As a four-piece, they have gone on to release an EP and some new singles; apparently, album number two is just around the corner. This song was well received at Eurovision 2014. It was written by Topi Latukka and Henri Oskár. The band competed in Uuden Musiikin Kilpailu 2014, the national selection for Finland's entrant into the Eurovision Song Contest 2014, and they easily won. The music video is a pure performance piece. I don't usually have a problem with these sorts of videos, as long as they're good, but Softengine fails to excite the viewers. Considering they would perform on the Eurovision stage, a pure performance-based video isn't exactly great promotion for the song. There's not an awful lot to say about this video. The band seem quite static as the camera spins around them. The low angles fail to capture the audience in, and doesn't make for a pleasant viewing. There's nothing else I can comment on. This video doesn't draw the audience in and they performed so much better on the Grand Final and the Semi-Final than they did in this music video. It's just not engaging enough.